The muslin Jamdani sari weavers are passing a busy period creating contemporary and traditional sari designs ahead of the biggest Muslim festival Eid-ul-Fitr. The weavers have been weaving silk yarn jamdanis for several years at Satasi and Mazurdia village under Satyar union in Boalmari upazila here. The traditional fabric has gained the Geographical Indication (GI) recognition as a product of Bangladesh. Local small enterprises here have been weaving Muslin Jamdani without any government or private patronage. During a recent visit, UNB correspondent found the weavers here start their work with the light of dawn. Benares Jamdani Sari is a variety very popular with high demand among the customers in the domestic market. But the prices of various materials including cotton, power, artisans and machinery have increased in current market, weavers said. Locals said from here some youths went to Jamdani Polli of Narayanganj district searching for jobs. Then they started working in jamdani factory and worked there for two years. From that they began to dream of earning more money by establishing their own weaving factories. Among them, Mohammad Abu Naser and Touhid Biswas returned to their village and started jamdani weaving. Talking to UNB, Towhid Biswas said at first, he started muslin jamdani sari weaving through a loom at his house. He trained his brother Yusuf Biswas and some others about jamdani weaving and how to run loom. In this way, he has established five looms at his home. He has to take loan from NGOs with big interest. As a result, entrepreneurs have to face difficulties to make profit. They urged the government to give them essential aid to set up more looms which play an important role in rural economic development. Similarly, Abu Naser trained his wife Alandi Begum and his brothers and established a total of eight looms at his house. He gets five jamdani saris from each loom in a month. Two weavers work in a loom, locals said. Abu Naser said a jamdani sari is being sold Tk 3,000 to Tk 20,000 in the markets. We need yarn worth Tk 600 to 800, and sometimes Tk 1500 to 2000 per sari. The weight is around 200gm to 250gm of each sari. Ali Akbar of Majdudiya in the upazila said he has been running six looms at his house for the last five years. 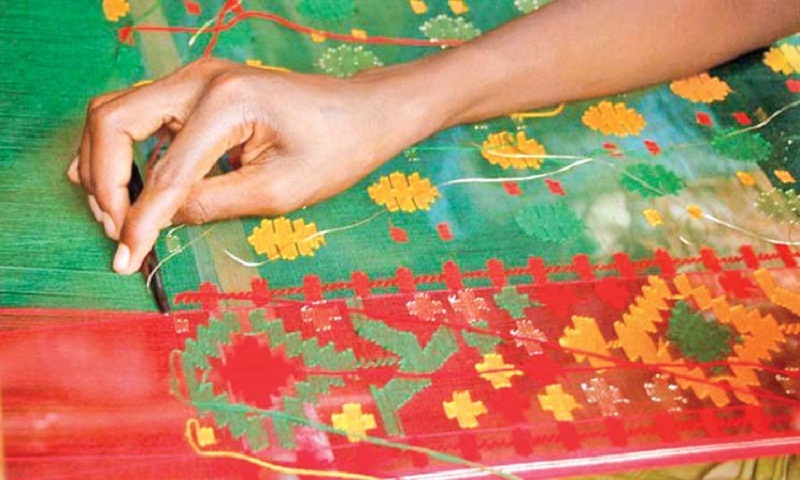 Weavers can ready a sari within four to five days. Now the prices of loom-related materials have increased compared to the past, he added. The entrepreneurs said they have to purchase cotton yarn at Tk 60 -85 per vori (1 vori=11.6 grams) from Narayanganj. Many school going children are working in their free time for extra income. Minor weavers Jihad Biswas,10, Hridoy, 14, Zahid,10, Arshad, 8, Sagar Biswas,10 and Deen Islam, 12, said they are very happy working in looms as they get money for education expenditure and can contribute to their families. Union Parishad chairman Majibur Rahman said there is a high demand for Banarasi Jamdani which is made from handloom here. It will be possible to keep the handloom alive if it gets necessary patronization of government, he claimed.